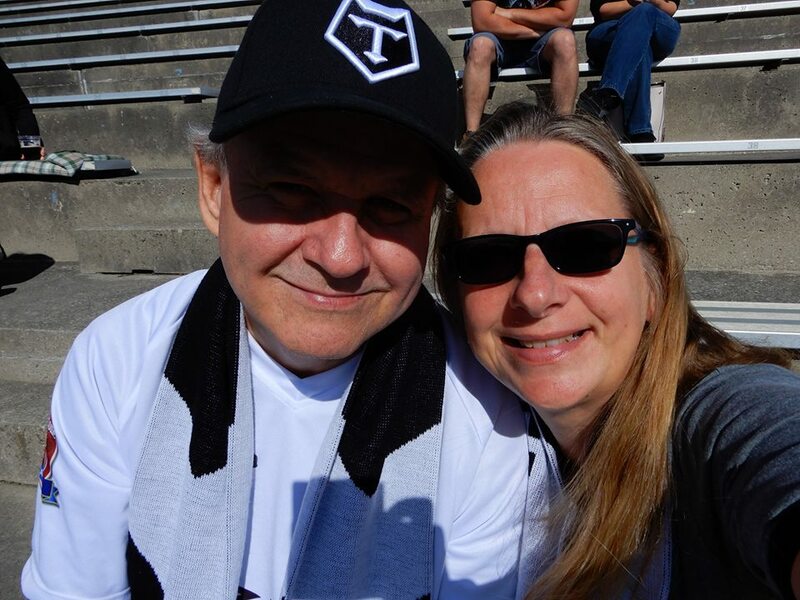 The World of Gord: Toronto Wolfpack Wins Championship! This afternoon Teena and I were at what hopefully would be the Toronto Wolfpack's Championship game against the second place Barrow Raiders. Above is the cup they would be playing for and, more importantly, promotion up the the second level Kingstone Press Championship League. After the regular season, the top eight teams advance to the Super 8s competition. Teams play each other once and the first place team after the round wins the championship and earns promotion. Second place then plays the fifth place club while the third place team plays the fourth. The winners square off in a one game showdown to see which team earns the second promotion to the Championship League. The She-Wolves were out before the game to warm up the crowd, who were already excited. Here we are before the game. We arrive early to get our centre field seats. The national anthems were played. Fans aren't allowed into the western stands until after the game starts. A team record 7,972 fans showed up for the game. Damn, I thought we would top 8,000. It's not rugby without a scrum. In league play, there are very few. The Wolfpack defence played tough the entire game. During the first half, Barrow pressed the pack in their own end quite a bit. At halftime with a slim 8-0 lead, the junior She-wolves came out to perform. This is quite a flip! The She-Wolves came out before the start of the second half. The hot dog cannon was in full use. Here's a dog being fired up into the stands. Liam Kay ready to go. Another crushing tackle as Barrow try to break out of their own end. Except for the ball carrier who is being hauled down, not another Barrow Raider in sight. Fielding a kick in our own end zone. You can see the beer gardens is a very popular place for fans. Celebrating a try, which would be their last of the game. Team captain Craig Hall puts away the two point conversion. When the horn went, the Wolfpack had taken the championship winning 26-2. Barrow played tough throughout the day, being down just 8-2 fourteen minutes into the second half before giving way to the Wolfpack onslaught. Even though the Toronto Wolfpack are the Champions, they still have one more game left in the Super 8s against Doncaster, who are fighting for that valued fifth place position. The pressure is off the Pack, though, and Teena and I will be there for the Wolfpacks final game of the year.